So, on Saturday we met at Pier 60 for a run that started around 6am. I live about 40 minutes from there so I was about just after 4am just so that I could eat breakfast and get my coffee before heading over. With a 13 mile run planned, I didn’t want to take my morning nutrition lightly. I’ve actually started treating my weekend training almost like a race. Last time I went out with these guys I just didn’t prepare myself well enough. I think once it gets cooler I don’t need to worry about my nutrition quite as much but with the brutal heat right now, I burn way more energy on these runs. I took 20 oz of water along knowing there would be at least 2 or 3 places to refill. The weather was warm (around 73 F) but because it was overcast it never really got much above the upper 70s which was awesome. There wasn’t too much wind either in any direction so the run itself went great. Last time I struggled badly at the end but this time I felt fresh all the way till the finish. I had plenty of Gu this time and I also found a new brand of running snacks that were incredible called Honey Stinger. I’ll be ordering a box from Amazon. These things are so good that I’d eat them by themselves. Kinda dangerous. All natural ingredients for people who care about that. They also make gels so I may replace my Gu with Honey Stinger brand gel. It was a really nice size group for the run. I’m not sure exactly how many were on the run but I feel like it was about 14 or so. Someone went out ahead of time and left coolers with water and Gatorade on the route which was awesome. Florida is just deadly hot even on a cool day during the summer so I can easily go through 40+ oz of liquid on a 13 mile run. I like to weigh myself before and after a run like this and even with having 60-70 oz of water/Gatorade, 16 oz of coffee, 8 oz of milk and a whole meal before I got home for the post weight I still lost over a pound. That’s a lot of water! We followed the run up with a group swim off Clearwater beach. I rarely get my open water swims in since I’m not super comfortable just going alone so I really liked having the big group. And my inability to swim quickly was confirmed! I was the slowest swimmer there. I’m still not sure exactly how to get faster but I’m working on it. We followed up the next day with a planned metric century ride (62 miles/100km). Again, I had to be up early since the meeting spot is about 45 minutes away and wheels were rolling around 7:15 (ok, I knew I had till 7:30…) I had a slight issue when I had gotten home on Saturday evening and discovered a swarm of something had invaded my house. I don’t know where they came from but I do know that it kept me up a lot later than I expected dealing with it. Unsurprisingly, I woke up late! I had to be out the door at 6:15 and I wanted to eat before hand. When I opened my eyes I saw 6:08 on the clock. I can’t emphasize enough that when you want to train in the morning, even if you’re going solo, you should prep the night before. Even when I’m not in a rush, I’m tired in the morning and might forget things. I set some sort of record and got my bike racked and out the door, forgetting nothing, by 6:17. That was enough time to even grab some coffee before the ride. 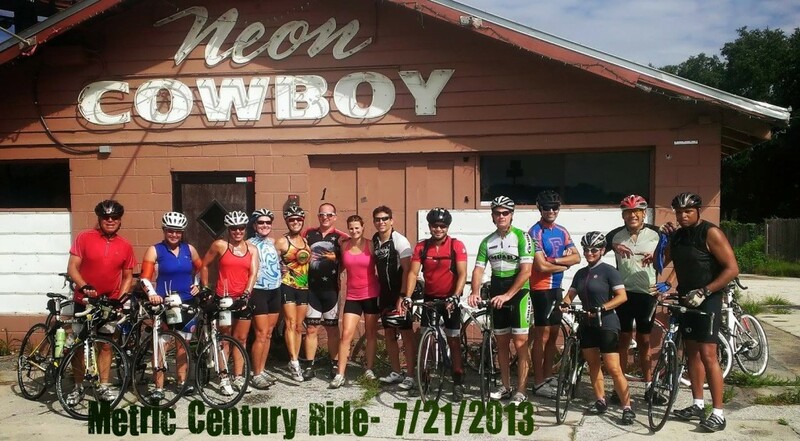 We started the ride with 18 – 20 riders and started up the Suncoast Trail starting at 54, just north of Tampa. Tampa isn’t the greatest place for riding bikes but the places we do have to ride them are great. 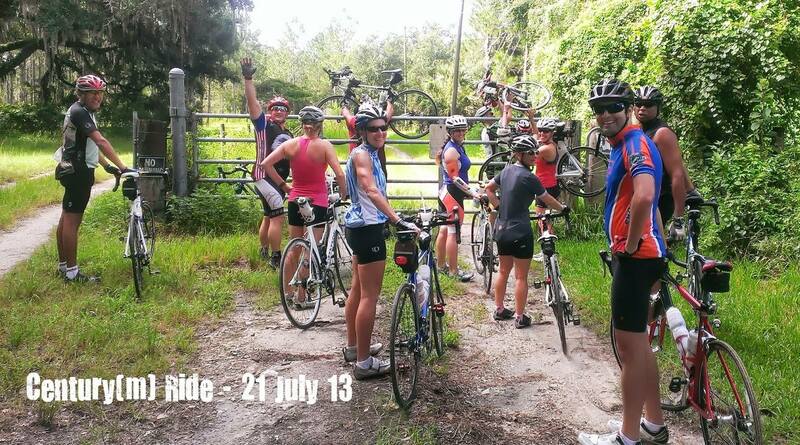 The Suncoast Trail is about 40 miles long so its possible to do a huge ride just on the trail. There is a park at the 21 mile mark of our ride and that was where a small group broke off and headed back for a shorter ride. That left 14 of us to finish the century. This is also where we departed the trail (to my surprise) and headed to an area called San Antonio. This is a nice, fairly low traffic area that’s got mostly rolling hills with a couple larger climbs (for Florida…). I wasn’t expected that so when the one real hill we did on the ride showed up, I asked for my money back. Instead I just had to climb the hill. Coming down was fun at least since I haven’t hit 30mph on my bike in a long time! After that we continued through the countryside until we got to a biker bar and our first photo op. Even though it was closed, there was a biker in the parking lot who was amused at our arrival and graciously snapped a couple photos so we could all be in it. Once we finished our shots, we got back on the bikes and headed for…ADVENTURE! Someone was asking if we had to climb fences this time and I thought he was joking. Well…the road we were turning on suddenly turned to dirt and we ran into…a gate. So apparently that was no joke. There used to be a rider who had the key but they weren’t on this ride so the only way through was over the gate. We are all on road bikes and the path on the other side was mostly sand. That was not fun but we all survived to get on some really poorly maintained asphalt again before we ran into…another gate! This required yet another climb and finally we were back on well maintained trail. The first of two beyond category climbs!